R&D department at Hidria is using MonoDAQ-U-X to acquire data from pressure sensors and measure temperature. »Small, powerful and easy to use device. In just a matter of minutes you can prepare a setup to acquire and analyze almost every analog or digital signal or even create some outputs at the same time. I think it is a tool every engineer should have for his daily work.« – Jure Golob, R&D, Hidria d.o.o. Environmental or climatic chambers are enclosures that simulate specific climatic states. Most commonly the ingredient is air that is brought to specific values of temperature, humidity or pressure in which products are tested. Temperature and humidity are two key parameters in most climatic chambers. Pressure is also important if vacuum or overpressure conditions need to be simulated. Presence of certain gasses can also be of interest. For the most precise measurement of temperature RTD sensors are used, typically for controlling the chamber. If extremely high temperatures are measured or if there are a lot of small measurement points on the specimen, thermocouples are used. 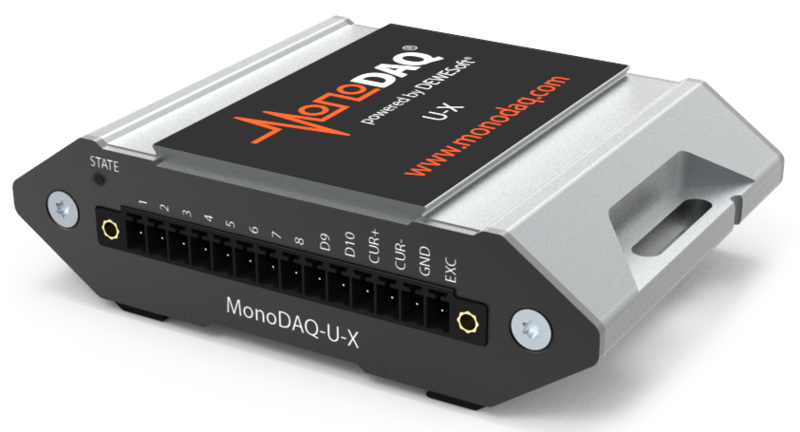 Signals from RTD’s and thermocouples can be acquired precisely and cost efficiently using MonoDAQ-U product line. Humidity and pressure sensor can also be acquired using the MonoDAQ-U products. When the distance between measurement points is large (in case of monitoring a group of chambers synchronously in the same software environment) the EtherCAT based MonoDAQ-E product line offers the most appropriate solution.